One of the most common sounds a cat owner is likely to hear from its cat is the famous meow. There are many different types of ‘meows’ and they are generally reserved for communicating with humans and not with other cats. Depending on your own particular cat, meows may mean different things, and if you pay close attention to the meows, you’re likely to notice the variety between them. Meows come in many tones and intensities and some meows are actually silent. You can see the cat’s mouth forming a meow, but no sound is emitted. In general though, the meow tends to mean that the cat wants something like a food treat, to be let outside or to be petted or played with etc. The ‘chatter’ is the sound a cat makes while stalking its prey. It is a lower, more guttural sound that a cat will usually make while its mouth is open and teeth are showing. Cat owners that keep their cats indoors are likely to have witnessed this when their cats are staring down and looking to pounce on a bird that it sees through a window. Caterwauling and mating calls are two vocalizations that are related to mating. They are usually made at night and are noises that frequently disturb people trying to sleep. These are high pitched noises of males trying to intimidate each other for mating rights to the female or the female herself signaling to potential males that she is ready for mating. These calls can be mistaken for a high pitched baby’s cry. Perhaps the most known and most loved vocalization that a cat will make is the purr. Cats tend to purr when they are content. They will usually make this noise when they are being petted, and sometimes they will even make this noise when they are lying in a warm ray of sunlight. It should be noted however that you cannot depend on the sound of a cat’s purr to indicate good health. Cats have been known to purr when they are injured or even as they are dying, so purring is also thought to be something cats do to calm themselves down. These are only a few of the vocalizations that cats make and there are quite a few more including growls, screams and other sounds that we haven’t named yet. Each cat is particular and may make slightly different vocalizations. 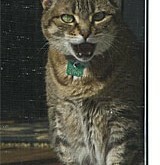 If you pay closer attention to the vocalizations that your cat makes, you’ll likely understand your cat even better. We have a rescued kitten. We have had her for a week now. Yesterday she somehow got outside. After many tears and much effort, we finally got her inside. Since her “mini” adventure, she now walks around the house “meowing” constantly. Our other cats are petrified of her. We are told she is about a year….. to me she seems about 6 or 7 months. What to do???? Please feel free to post this on the forum as this is a bit too complex for a blog comment. Thx!